Hilandar Monastery (also spelled Chilandari), (Greek: Χιλανδαρίου, Hilandariou; Serbian: Хиландар, Hilandar) is the northern most monastery located on the northeast side of the Athos Peninsula in northern Greece. The monastery was founded in 1198 by Ss. Sava and Simeon. The Monastery has been supported and populated by Serbian monks since then. 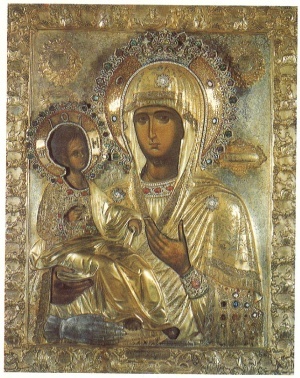 It is ranked fourth in the hierarchical order of the twenty monasteries located on the Mount Athos peninsula. After forming the Serbian state Stephen Nemanja, the Grand Župan of Serbia, in the Council of Ras in 1196 established the basis for smooth successions of power within the state. He, then, abdicated in favor of his middle son Stefan and proceeded to pursue a life of spirituality and pray as the monk Simeon. He joined his youngest son, Rastko, who earlier had taken the monastic name of Sava and lived on Mount Athos. With the approval of the Emperor Alexius III Angelicus, who in his chrysobull of 1198 declared Hilandar as an independent monastery dedicated to the Serbians, the father and son began restoring the ruins of the old monastery as the foundation of the present day community. Hilandar became the spiritual and religious center for the Serbs. 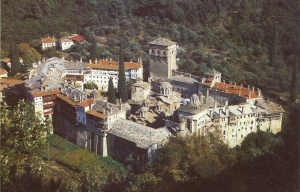 In 1430, the Holy Mountain of Athos was occupied by the Ottoman Turks. While the Turks did not interfere with the autonomy of the monastic communities the monks were affected by the lost of income from their estates that had been taken by the occupying Turks. Thus, their survival became difficult under the new overlords. The monastery remained a symbol of Serbian culture and religious continuity and was endowed by Serbian rulers through the centuries. Whereas most of the monastic communities on Mount Athos are built on the shore of the Mediterranean Sea, Hilandar is located a few kilometers in land. The complex includes within its protective walls a katholikon and a number of small chapels, as well as cells for the monks, guest quarters, a library, treasury, and a hospital. On March 4, 2004, a major fire sweeps through the monastery that destroyed about half the structures in the monastery. The medieval heirlooms and relics that made up the treasures of the monastery were moved to safety, but major damage was done to the abbot's cell and guest rooms as well as four chapels with the seventeenth and eighteenth century frescoes. Restoration of the damage is on going. The monastery possesses over 1,000 thirteenth- to eighteenth-century Byzantine and Serbian icons as well as sacred objects, various artifacts, and historical documents. Many of these dated from the thirteenth century. The library contains a collection of books and some 1,000 manuscripts including Cyrillic manuscripts and the first printed books in Serbian. The library also holds many books in Russian, Bulgarian, and Greek. This page was last edited on January 4, 2012, at 21:11. This page has been accessed 38,497 times.